Damaged storage tanks at the Husky Energy oil refinery. At the height of the Husky Energy oil refinery fire in Superior, WI, this past Thursday when dark, acrid smoke billowed into the sky for miles, every one kept repeating the air was safe. But multiple experts said the black plume of smoke from the refinery fire was almost certainly full of toxic fumes and carcinogens. In fact, it’s the smoke plume, and potentially toxic gas plumes, that spur pre-planned evacuations for miles downwind of refineries when a major fire breaks out, said Neil Carman, a former refinery inspector for the Texas Commission on Environmental Quality and now with the Lone Star chapter of the Sierra Club in a published report in the Forum News Service. That is exactly what happened when the fire broke out, officials ordered an evacuation. The U.S. Environmental Protection Agency (EPA) said burning asphalt gases include volatile organic compounds, or VOCs, which can cause symptoms ranging from dizziness, breathing problems and nausea to liver damage and cancer, depending on the level and length of exposure. “There were very low, trace levels, well below any health standards, of volatile chemicals and dust and particulates,” Morrison said in the report. 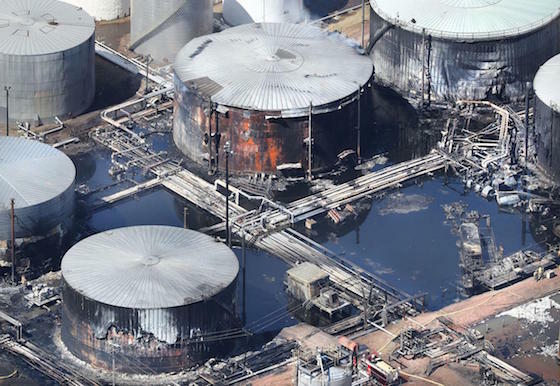 In addition to the toxic smoke from asphalt burning, officials were extremely concerned Thursday the fire would spread to a tank of hydrogen fluoride, a federally regulated toxic chemical that some public safety groups say is inherently dangerous.